SecureBand featured in RFID Journal - February 9, 2011 issue. Exciting news for Laminex/CredentialExpress. The new SecureBand RFID wristband proved successful at the ACL festival in 2010. Read the entire article. Learn more about selling the SecureBand product to your customers by calling (800) 438-8850. See the icon in the circle? It means a high frequency RFID chip is inside the card. 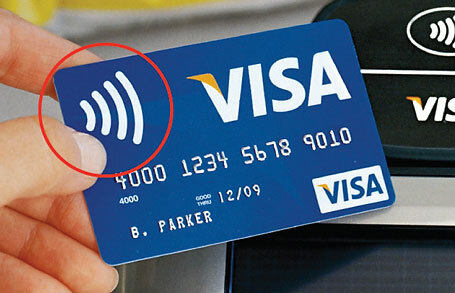 This icon is usually printed smaller on the backside of credit card. If the card has this feature it is quite useful for quicker purchasing, but the card information can also be skimmed by a bad guy. Visit skimsafe.com for a solution to this problem.